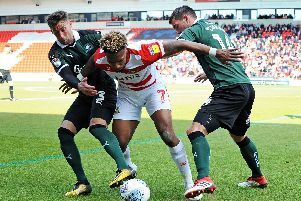 Doncaster Rovers left themselves too much to do as they went down 2-1 at in-form Coventry City. The Sky Blues took charge with first half goals from Jordy Hiwula and Luke Thomas – and held on to record their fifth straight league win. Joe Wright halved the deficit midway through the second period with a close range finish but it proved to be in vain. It was an even contest until Hiwula broke the deadlock but Coventry took charge until half time and extended their lead accordingly through Thomas. Rovers dominated the second half but found it difficult to carve out clear openings. They came agonisingly close to snatching a late point but stand-in captain John Marquis saw his stoppage time effort blocked on the line. Marko Marosi made two impressive saves early on to keep the home side at bay. He backpedalled to tip over Michael Doyle’s deflected shot and was at full strength to palm away Tom Davies’ header from Doyle’s freekick. Another Doyle freekick led to the opening goal midway through the first period. Rovers could only half clear his inswinging delivery from the right and Hiwula smashed home on the volley from close range. Rovers had threatened themselves from set pieces and might have gone ahead moments before falling behind but Wright just failed to connect with Danny Andrew’s corner from the right and Tom Anderson headed over James Coppinger’s delivery from the right. The visitors lost their way after falling behind, unable to gain any control in midfield and losing too many second balls. Coventry extended their lead on 41 minutes when Thomas was given too much space and he lashed home a left-footed effort from distance which went in off the post. Rovers enjoyed plenty of possession after the re-start but struggled to make any serious inroads or get behind the home team. But their territorial advantage eventually paid off on 69 minutes when Coppinger sent a ball over from the right and substitute Paul Taylor’s effort fell kindly for Wright who converted from close range. Jodi Jones curled one just over for the hosts but it was Rovers doing all the pressing. Ben Whiteman volleyed one just wide before, right at the death, Marquis got on the end of Danny Andrew’s cross but his shot was blocked by a combination of Burge and a defender. Coventry: Burge, Thomas, Brown, Willis, Davies, Sterling, Doyle, Bayliss (Kelly 64), Hiwula (Ogogo 81), Clarke-Harris, Chaplin (Jones 72). Subs not used: O'Brien, Hyam, Bakayoko, Thompson. Rovers: Marosi, Blair, Wright, Anderson, Andrew, Whiteman, Kane, Crawford (J Anderson 57), Coppinger, Wilks (Taylor 57), Marquis. Subs not used: Lawlor: Amos, Horton, May, Longbottom.